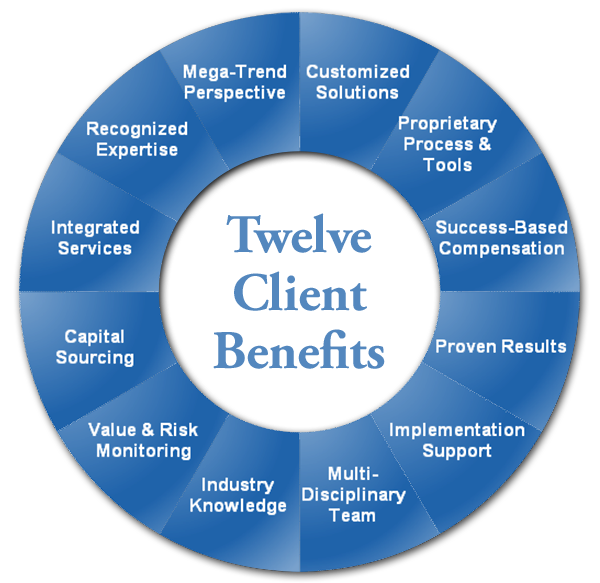 Having now practiced for over 35 years, we believe that our firm offers 12 Practice Attributes that are not often present in most firms. We recognize that you have choices when it comes to selecting a professional services firm, and encourage you to compare us to other alternatives. 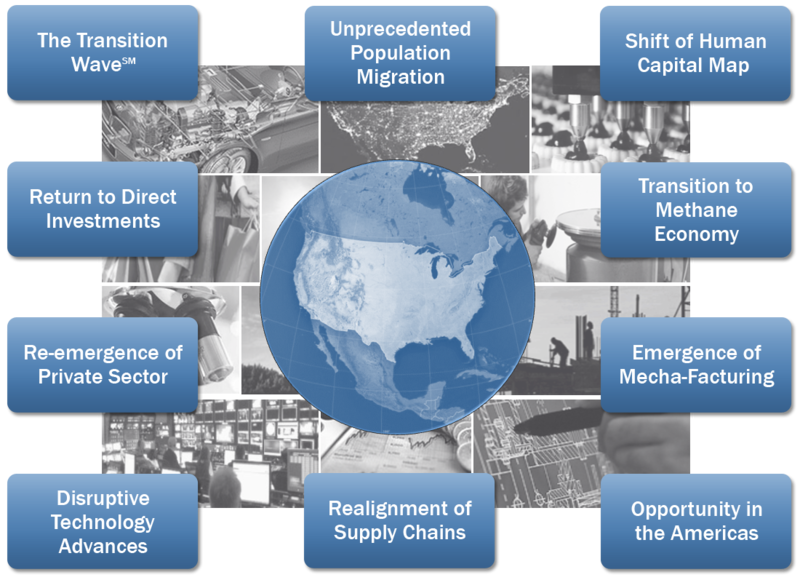 We have also analyzed the impact of these mega-trends on the 12 industry segments that we service. As these mega-trends “sweep over” our economy, there will be winners and losers. We can help you understand the impact of these trends on your business, and take action to best position yourself for the outcome. Since our mega-trend research is proprietary, we do not publish our research and conclusions, as many clients are relying upon the knowledge and insight to drive competitive advantage in their industries. If you would like some additional information on how these mega-trends may benefit or affect you business, we would be pleased to have a discussion with you. We are very capable when assisting clients with any of the four business solutions we offer; Business Growth, Company Capitalization, Generational Transition and Shareholder Liquidity. However, often it is necessary at the outset of an engagement, or over time, to integrate some or all of these four disciplines. For example, a business may need to rethink its strategic positioning and growth strategy, and capitalization, while also preparing for generational transition. Our client references will confirm that we are expert in customizing solutions based upon the needs of our clients. While clients interact with our professional team members, quietly in the background, our team members leverage their expertise through proprietary process technology and practice tools that we have built over three decades. We have both quantitative and qualitative research, assessment and analytical tools that assist with decision making and results tracking. Often we are assisting clients on major initiatives related to growing their business, improving profitability, financing the growth of their business, successfully transitioning to the next generation, or providing liquidity for some of their shareholders. In these sorts of engagements, our clients need not only sound advice and analysis but, even more importantly, to successfully achieve the desired results. We are willing to structure compensation on these types of engagements, which is linked to measurable implementation success. After 35 years, hundreds of successfully completed client engagements, many clients served for a decade or longer, and after billions of dollars in successful business development results and transaction completions, it is easy for new clients to confirm, “we do what we say we will do.” We are pleased to provide client testimonials and references. A “good plan” may be just that, if it is not properly executed. Future growth strategies often involve new directions and resources. As many of our senior professional staff members have considerable experience in corporate development and operations, the “plans” that we help clients to develop, we can also help to implement and monitor. Since we started in business in 1982, we have operated a multi-disciplinary professional practice. We offer a combination of senior professionals who have both functional expertise and industry knowledge. Our professionals collectively have a combination of advisory, consulting and transactional experience, and/or corporate development or senior operational skills. They typically hold advanced degrees or certifications from leading business schools or professional institutes. One of the more unique aspects of our practice is combining broad-gauged, experienced advisors with industry-specialist corporate development teams. There are certainly many process steps, irrespective of your industry, that are similarly applied if you need to grow or finance your business; transition ownership from one generation to the next; or seek to monetize some or all of your business equity. Rigorously applied processes often maximize results and efficiency. At the same time, many firms lack industry knowledge, contacts and perspective, which can be decidedly advantageous at times. Granted, you would not be successful in your business if you were not already knowledgeable about your industry, however to generate the best results you will often need an advisor that also understands the fundamentals and economics of your industry. Often the wealth management plans of business owning families are based upon unrealistic assumptions about the value of their business holdings and the risks that such businesses may face in the future. Also, there is typically no understanding or management of risk between their operating businesses or assets and other investment holdings and, as a result, true family enterprise-wide risk vs. return analysis in incomplete. We are capable of providing comprehensive, customized and periodic reporting of portfolio holdings by types of risk. We have always sought to serve business owners who wish to grow and transition their companies over a number of years. Growing and transitioning businesses often best occurs one-step at a time. To plan, execute, monitor, realize objectives and then start over again is a continuous process, which also requires coordinated efforts relative to the development or improvement of business governance and family governance processes and systems. Our proprietary process and tools, and multi-disciplinary staff, enable us to seamlessly deliver integrated services to clients, when and as needed, today and over time. Beyond our proven results with clients, as a firm, we are widely recognized within our industry as a leading advisor to business owning families, closely held companies, and family offices. Our senior professionals have published, educated, shared and collaborated in an effort to demonstrate leadership, and in an effort to influence other practitioners to deliver the best possible results for clients.